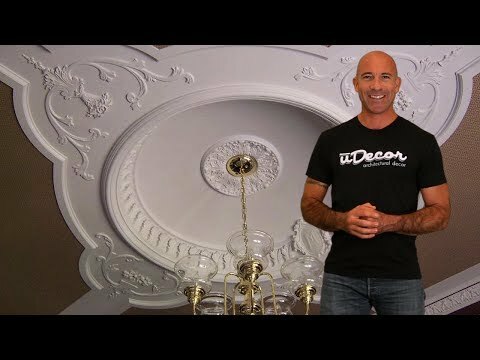 The MD-7047 Ceiling Medallion is 23-1/2" in diameter and has a depth of 2-1/8". The items arrived in perfect condition and the quality was fantastic. I have purchased several medallions and I was thrilled with all of my purchases! Very nice quality at a good price! Very nice quality at a good price. Make sure that you use a good quality paint. In the past I've used cheaper paint/primer bought from big box stores and it took multiple coats. This time I use a high quality BM brand gloss and it looked perfect after a single coat. Very rich and elegant for price..so many compliments.Love it!! Customer service was awesome and follow up. Great product and very efficient delivery. Used for chandelier, greatly improved its beauty. This is a beautiful product - we purchased two of them and have had so many compliments -- they went above and beyond to make sure that these arrived in time for my painters to paint them - we were on a tight deadline -- Would most definitely buy from them again - have recommended them to so many just from these medallions in our family room! A Thanks so much!